Successfully Added GP9S Mini Projector - 150 Inch Image, 800 Lumens, 600:1 Contrast, 800x480 Pixel, 1080P Support, AV-IN, USB, HDMI, VGA, SD Card to your Shopping Cart. The GP9S mini projector is small enough to fit in your bag yet powerful enough to bring life-size entertainment where ever you go. This home theater LED-based mini projector is less than 700 grams (1.5lb) and sits ever so easily in your hand making it a portable projector that's convenient to take to office meetings, friend houses, or on holidays. With its single-chip LCD display technology, this mini projector brings 150-inch images for a stunning viewing experience and it's 800 by 480 display resolution along with 800-lumen projection brings a bright and crisp display that's good for movies, gaming, and presentations. Supporting 1080P video decoding and with all the common ports for HDMI, VGA, SD Card, USB and AV inputs you can hook this pocket projector up to a wide range of devices such as games consoles, set top boxes, TV boxes. DVD players, memory pens, camcorders, action cams, Computers and more. Now you can share all your photos and home movies or setup a home movie theater with minimum fuss, It couldn't be easier. A 600:1 contrast ratio brings a rich pallet of dark and light tones while 1.67 million colors will ensure a realistic life-like projection. 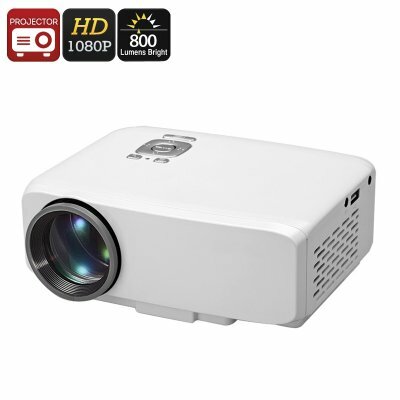 With its quick and easy setup, minimal storage space, portable profile and wide connectivity the GP9S mini projector is the easy way to take a 150-inch image wherever you go and is like having a large screen TV in your bag. The GP9S mini projector comes with 12 months warranty, brought to you by the leader in electronic devices as well as wholesale mini projectors..